Modern Office Chairs - Which Material is Best for Your Workplace? When choosing modern office chairs, design, affordability and ergonomic factors are important factors to consider – and so is the type of material. By taking the time to source contemporary office furniture that is comfortable, supportive and easy to maintain, you’ve made a significant contribution towards the overall design of your office space, your brand as a whole, and the productivity of your employees. Good quality materials are built to last, so your office’s new look will stay looking great for many years to come. The chair material you choose should also be stain-resistant to handle clumsy coffee mishaps or lunches, easy to clean so that you don’t have to call in professional upholstery cleaners every few weeks, and attractive to look at so that it enhances your entire office design. Mesh chairs – Easy to clean and breathable, these fiber-plastic chairs also give flexible support for comfort. 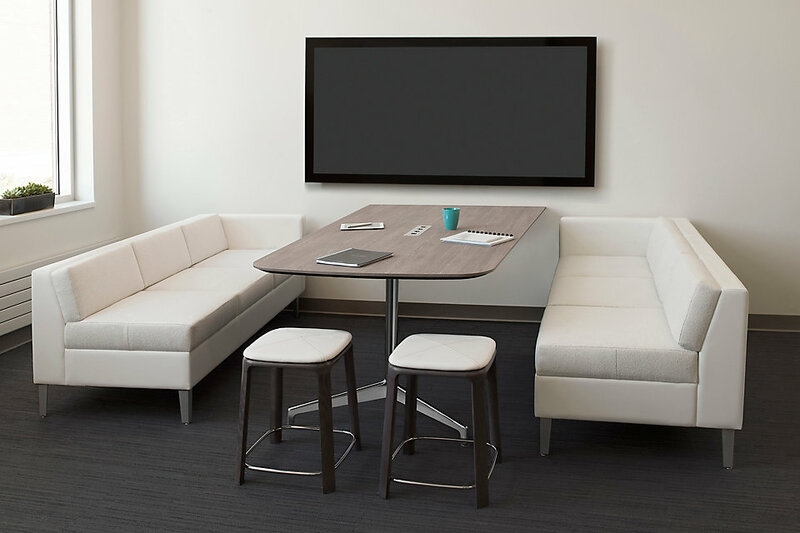 While they aren’t ideal for long periods of sitting, they make a great fit for cafeteria spaces, reception seating or seating in rooms used for training or presentations. Fabric chairs – A classic chair material that is seen in most general-use office spaces, these are usually the most affordable seating option on the market. They also come in a wide range of patterns and colors, so you’re sure to find something suitable for almost any space. On the downside, they tend to stain, wear and mark pretty easily, so you can expect to clean them more often and not last as long as other options. Leather chairs – Another classic is the leather office chair – an icon of the executive office space. Available in genuine or faux leather, these are durable, stain-resistant, easy to clean and have plenty of style. Although they come in different designs, leather chairs are usually the stable of the corporate world, so they may not suit every brand. Another factor is the price, although faux leather is considerably more affordable than the genuine item. Most offices choose to have this seating in specific areas like executive offices and boardrooms as a result. Setting up your company boardroom is about more than just selecting impressive furniture; you need to consider the space itself too if you want it to be fully functional. Here are some tips from our design team. Walkways: Entry paths need to be a certain width to ensure comfort for people sitting at a boardroom table as well as those moving past them. This means ensuring that there is an unobstructed walkway of 36 inches at a minimum between the table and wall. Where there is seating, this should be extended to 42 inches to ensure that people can be comfortably seated while still allowing others to move past. Table shape and size: Your boardroom table is the focus of this space, so it’s essential that it is the right proportion and shape for the space. Too big and everyone will be cramped, too small and there won’t be enough space to seat everyone. The shape influences how many people can be seated at the table at one time. Rectangular, boat or square tables provide the most seating for their size, while round, oval and racetrack provide the least. For example, a rectangular table that needs to seat 8 people will be around 4×8 feet and require a 11×17 foot room. A round table for the same number of people will be 8 foot in diameter and require a 15×15 room. A videoconferencing table for 7 people will be 5×8 feet in size and require a 12×15 foot room. 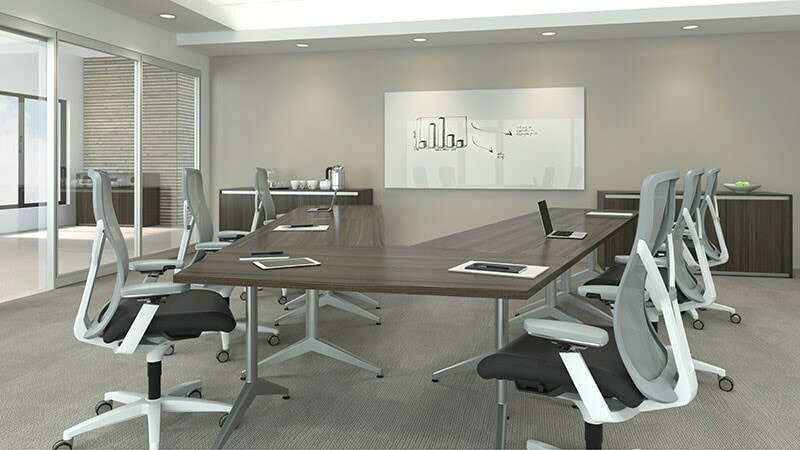 Boardroom chairs: There’s a wide range of chair styles and shapes on the market and it’s best to go with something that really suits the tone of your brand – but keep in mind that the chair width will affect how many people can be comfortably seated at the table. It’s important that these chairs are adjustable and ergonomic, so that they’re comfortable and supportive during longer meetings and conference calls. Additional boardroom furniture: Although these are multifunction spaces, most boardrooms look best when they furnishings are kept minimal. However, if you use video conferencing equipment, want to use the space for presentations or other activities, there needs to be sufficient space designated for these activities, including screens, AV equipment and presentation space (usually 5 feet along one length or width of a room). To add character to the space, a large piece of art is always a good choice, as are architectural glass walls. Great Ideas for Celebrating Earth Day at Our Office! ​April 22nd is Earth Day, and businesses all around the world are joining in the fight to celebrate the earth and protect its resources. This year’s theme is “Protect Our Species”, focused on preventing the extinction of animals, plants and insects due to human activity. Here are some ideas for companies of every size who want to show that they care, from our specialists in modern office cubicles. Plant a tree: As the saying goes, the best time to plant a tree is yesterday, the second-best time to do it is now! Get permission well in advance to plant a tree (or several) either in your office grounds or a local park. Choose trees that are indigenous to your area and are rare or under threat of extinction, so that they boost the local eco system. Have an hour or so set aside to pant the tree together and have a picnic! Get competitive: A company-wide competition is a great way to get everyone actively involved in this great cause! You can split people into different teams by department or project and give them different targets for the competition. For example, you could challenge them to take certain actions that earn them points – recycling paper/plastic or minimizing paper use, coming up with a plan for their team to earn the biggest reductions in wastage or to introduce green initiatives in their designated workspace. Be sure to have a great prize as incentive! Conserve power: Offices use a significant amount of power each day through lighting, computers and digital devices. Send around some tips with actions that every employee can take to reduce their energy consumption, from switching off lights when natural lighting is sufficient, replacing bulbs with LED lights or powering off computers at night. You can also increase natural lighting in your office space by installing glass walls, reducing the need for artificial lighting. Volunteer: Make Earth Day a day off and volunteer for a pre-planned environmentally-friendly cause. For example, you could clean up a local river area, plant trees and flowers in a local park, or work with an organization that’s dedicated to assisting local wildlife. This is a great way to raise awareness about the local environment within your organization as well as a wonderful PR opportunity. Caring for the environment isn’t just something to do at home – you can make a significant impact in the workplace as well! Businesses produce a lot of waste and much of it can be recycled if the right policies and procedures are put in place. Here are some tips from our corporate office furniture team in NJ. Go paperless: Paper use costs companies a surprising amount of money – and when it’s single-use, it’s just not worth it to print it out. It’s expensive, causes wear-and-tear to printers, and is bad for the environment. Going paperless, even if you can’t manage to go completely paper-free, is a great cause that saves money. Any extra paper can go straight into on-site recycling bins. Install on-site recycling bins: One of the best ways to encourage recycling in your workplace is to make it as easy as possible. With clearly labelled bins installed in convenient but visible spots, it will take no effort at all to contribute to the recycling program. You should have different bins for each material – paper, glass, plastic and electronics. Support Green suppliers: Recycling isn’t just about the waste we create, but what we use as well. You can support recycling and eco-friendly initiatives by choosing Green partners for your business. You can find suppliers with environmentally ethical production methods who supply everything from stationery and accessories to décor and corporate office furniture. Educate, raise awareness and reward: It’s easy to get people on board with your recycling initiative if they understand the importance of being eco-friendly. Try to make it a fun and positive experience and you’ll soon find other people to support your cause. Ask for suggestions about how your company can be more eco-friendly, get feedback on policies that are in place, and get your teams competing to win fun rewards for their Green initiatives. Training and upskilling employees is a critical part of being a competitive and forward-thinking business, so it’s no surprise that top training companies are thriving. Your training space says a lot about your business – and it has to be functional too – so designing it can be a challenge. 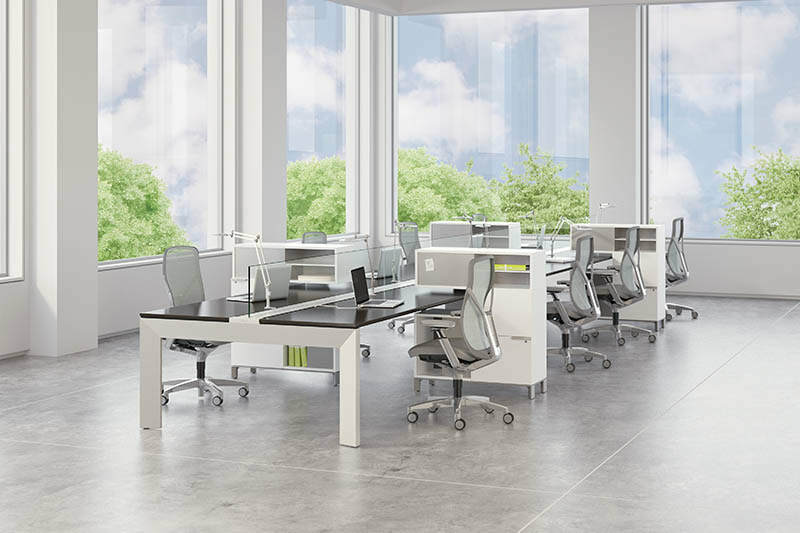 Here are some insights from our contemporary office furniture team in NJ. 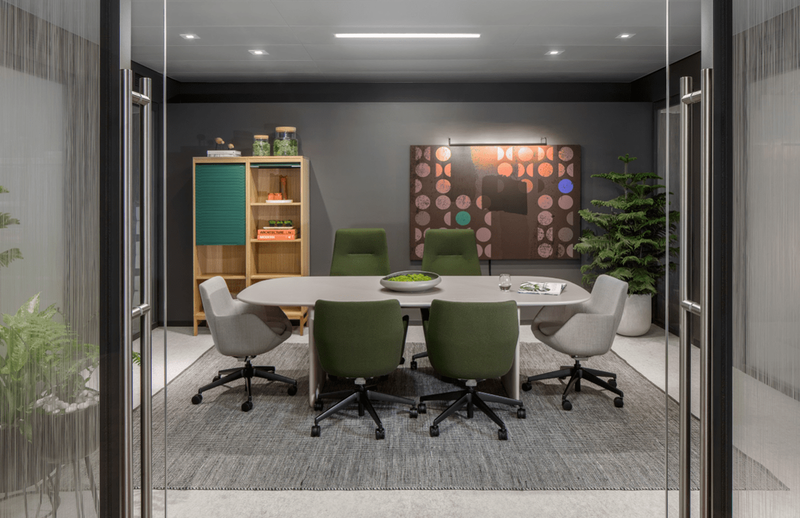 Calm and neutral: You’re going to have people from all industries, walks of life and all levels of the corporate world coming to you for training, so the space needs wide appeal. Calm, neutral, warm colors make people feel welcome and focused, and reduces distractions, supporting the mindset they need to learn. Mobile, adaptable furniture: You’re going to be training groups of different sizes and splitting them up to work on different skill sets, so your furniture needs to be easily moved, spilt up and re-grouped as you require. Lightweight chairs and tables, and modular units are best. Presentation space: You need a free wall or space where presentation boards, whiteboards or digital presentations can take place for the group – keeping in mind that some training specialists make use of multiple types of media when they’re teaching. Good lighting: Training often means intensive learning and long hours, so your lighting has to be perfect if you want people to be able to concentrate and focus during their session. A combination of natural light and artificial light (preferably LED lights as they are gentler on the eyes and don’t flicker) is best. Stay refreshed: The last thing your space will need is an easily accessible refreshment station. This is a great addition for training rooms as it means participants won’t have to leave the room or miss out on anything if they need a juice, soda, water or snack. The state of your office desk says a lot about you – but what would you like it to say? Here are some tips for accessorizing your desk, from our contemporary office furniture team in NJ. • Stationery: Gone are the days of standard pens and pencils – when you reach for some office stationery, it should brighten your day! Look for cute or funny stationery to add a little sunshine or get personalized stationery for a more professional look. • Mousepads: While these are essential, they’re not always delightful. Thankfully, there are mousepads for every style you can imagine! Choose one that matches your personal décor, highlights a fun hobby, motivates or inspires you, or even a high-tech mousepad ideal for tech junkies. • Storage tray: Every desk needs one of these to stay organized and free up some space. You can buy a storage tray almost anywhere, but it’s also a fun opportunity to think outside the box. Pretty gift boxes and wooden breakfast trays make quirky but functional storage trays. • Organize your wires: The more our workplaces advance, the more wires there seem to be! Invest in some cable organizers to keep them out of your way and buy a multi-plug adapter so you can keep all your devices easily plugged in. There are some great wire and cable organizers out there, from funny gags and pretty designs to cartoon superheroes. • Add some plant life: There are plenty of plants that can handle office life and they’re a great addition to your space. They help oxygenate the room, make you feel more connected with nature, and even boost mood and productivity. Designing an Office Cafeteria? Here’s What to do! Office cafeterias are a hub for your workplace – a space to unwind, reenergize, talk to colleagues and even hold informal meetings. Although it’s an often-overlooked space, according to research by Steelcase, 91% of employees feel that they need a space to recharge at work – and a cafeteria rich in modern office design ideas can do just that! Welcoming décor: Everyone should feel welcome and at home as soon as they walk into your cafeteria, helping them relax and unwind. Use natural lighting, art and color to create a vibrant yet relaxing ambience. Opening it up to the outdoors adds that much-needed dose of Vitamin D as well as a café vibe. Access to tech: If your business encourages employees to work flexible hours and pick their own surroundings, then your cafeteria can support this. Pop-up power allows employees to charge devices and run laptops from this space, and Wi-Fi keeps everyone in touch. This means you can hold meetings here in casual, coffee shop-type surroundings – everyone’s favorite kind of mobile working hotspot. Keep it fresh: Stock up on fresh fruits, snacks and sandwiches as well as coffee, tea and juices to help your employee keep their blood sugar levels stable and encourage wellness in the workplace. It’s an amenity that’s sure to attract new talent and make your team happy to come to work! Comfortable but hygienic: Cafeteria furniture should be comfortable but easy to clean and maintain. Because this is a food space, it’s important that it’s kept very clean, that food is prepared according to strict health standards, and that tables and chairs are cleaned regularly. Ask Our Contemporary Office Furniture Team for More Modern Office Ideas! At BE Furniture, we assist our clients in achieving an optimal workspace for their business. Whether you are looking to remodel your current waiting area completely or replace your furniture with contemporary office furniture, our experienced team can handle it all. We live in an age where everything is changing and becoming more innovative and advanced every day, and corporate office furnitureis no different. Here, our team takes a look at traditional and modern office furniture, and the pros and cons of each of them. Traditional office furniture generally includes styles and materials from earlier in the 19thcentury. Typically, you’ll see a lot of dark wood furniture that has been polished, carved or embellished with leather, and it’s usually fairly big, heavy pieces. The benefits of traditional office furniture include their durability, luxurious quality and association with wealth, success and history. If you source old traditional office furniture, you’re also upcycling, which is great for the environment. It does have its cons though. Big, bulky items often don’t fit into our current office spaces and may look old-fashioned or intimidating to younger clients. It’s often also very costly, due to the high quality and rare materials they are often made of. With the help of an office designer however, you can strike the right balance for your brand, ensuring that you still come in on budget and create a warm and welcoming space with a few carefully chosen traditional pieces. Modern office furniture, also known as contemporary office furniture, is strikingly different. It’s all about crisp, clean lines, simple designs and man-made materials like PVC, composite wood and metal. Here, you’ll find lots of lighter natural tones as well as bold, bright colors, and the focus is on creating small, modular workstations. The benefits of modern office furniture include that it fits well into contemporary office interiors, is easily assembled or moved around, it’s affordable, highly practical and allows you to make the best use of your space. It’s versatility also means that it can be designed to suit any brand, from law firms to tech startups and more. There are a few drawbacks as well – you have to shop carefully to ensure that you’re getting good quality items for your money, and it can look quite cold and sterile if not incorporated properly into your design. An experienced office designer can help you narrow down your options properly and deliver a flexible and welcoming furniture installment that connects with your brand and clients. Good lighting is a critical component in workplace design, affecting the wellness and productivity of your employees and preventing headaches, eyestrain, fatigue and even depression. Here are some tips from our team on how to perfectly light your office. Optimize your natural lighting: Sunlight is easy on our eyes, supports our natural rhythms, and it’s free, so it’s a great starting point for this component of your office remodel. 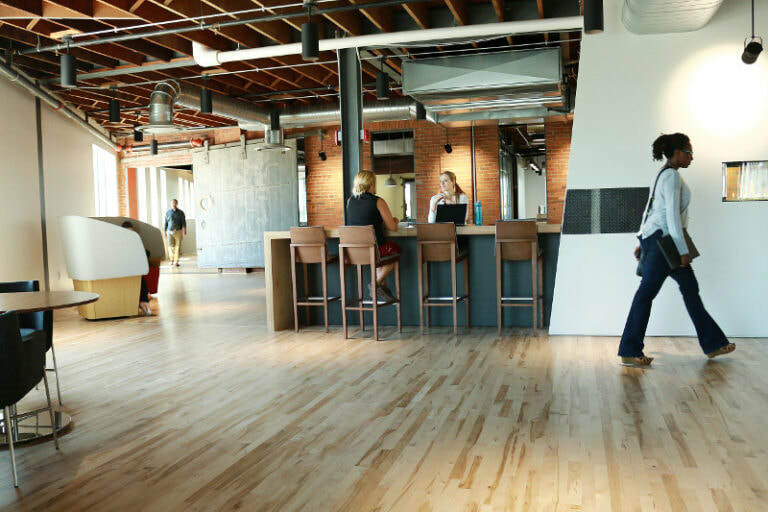 See where you have the best natural light and how you can use it to its full benefit, creating an inviting reception area or positioning a high-density workstation in that area. You can also increase natural light penetration into your office space by installing architectural office walls made of glass. Say goodbye to fluorescent lighting:These are the bane of many office spaces, and not just because of the harsh quality light they produce. Studies have linked fluorescent lighting to melatonin and cortisol suppression, as well as Seasonal Affective Disorder (SAD), and the flicker they produce is a direct cause of stress, migraines, anxiety, eyestrain. Instead, choose LED lights. These bulbs don’t flicker, more closely mimic natural lighting and are more energy-efficient, saving you money in the long-term. Balance task and ambient lighting:Ambient lighting is your general, overhead office lighting and should mimic natural lighting as closely as possible to create a comfortable, welcoming and productive space. Overhead lighting is best utilized by choosing lensed indirect lighting rather than direct parabolic lighting. Task lighting should be added in specific areas where brighter lighting is needed and should be switched on and off as required. Dimmer switches are a good idea too, allowing employees to better customize lighting, reduce glare, and create the right lighting for specific needs, like presentations. Small Breakroom? Here are Our Design Tips! The breakroom is an important part of any office design – a space where employees can relax, have lunch or chat during the workday. For many offices, finding enough space for a functional breakroom can be a challenge, but even a small breakroom can be a fantastic space! Here are some tips from our contemporary office furniture team. Finding the right tables and chairs:Small chairs and tables are absolutely the way to go in a small breakroom, as large furniture will just make the space feel cramped. Round freestanding tables usually make the best fit, as you can fit more people around them and offer more eating space than other shape tables. If you encourage your employees to be flexible with their lunch hour, then you won’t need a chair and eating space for each person. Another good idea is to have a narrow bench built along a wall or corner to offer flexible seating that’s out of the flow of traffic. How to decorate a small breakroom:Light, neutral colors will make the space feel bigger and brighter, but don’t be afraid to add color. Bright chairs or wall art, a plant in a pretty container, or a bold accent wall will draw the eye and add vibrancy. Remember to stay minimalist in this space – too many décor items will make it look cramped. The best approach to window treatments:If you have a window, try to maximize the amount of light you get from it, so avoid bulky window treatments like curtains or chunky blind. A slim blind is fine, but it can look great left bare. You can always liven it up with a plant or pretty vase. Add some luxury touches: Just because you have a small space doesn’t mean it can’t be a great space to use – and luxury extras will make all the difference! A top-of-the-range coffee machine, elegant mugs and espresso cups, fresh snacks and other touches of luxury will make your breakroom more like an exclusive café and less like a cafeteria.